Visit BookSwim online at BookSwim.com for all the books you want to read but don't want to spend the money on. BookSwim has a rental program where you rent the books you want to read and when you're finished you ship them back. 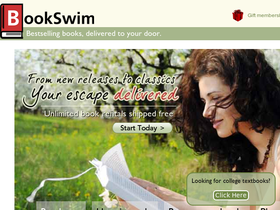 BookSwim has unlimited rentals and free shipping. Whether you read slowly or devour books, BookSwim has a rental plan devised just for you. Save on your next purchase from BookSwim.com with BookSwim discounts, BookSwim coupons, BookSwim promotions and BookSwim savings from 58coupons.com. Head on over to BookSwim.com and save 25% on first month membership. Head on over to BookSwim Book Rentals and save 10% or more on plans. Click link for details. Enjoy free shipping on all your book rentals from BookSwim.com. Click link for details. Receive up to 3 books at a time with unlimited reading starting at only $23.95 from BookSwim.com. Click link to view.